ab167129 is predicted to not cross-react with TORC1. A 16 amino acid synthetic peptide derived from near the C terminus of Human TORC2 (NP_859066). Our Abpromise guarantee covers the use of ab167129 in the following tested applications. WB Use a concentration of 0.5 - 2 µg/ml. Predicted molecular weight: 73 kDa. Most abundantly expressed in the thymus. Present in both B and T lymphocytes. Highly expressed in HEK293T cells and in insulinomas. High levels also in spleen, ovary, muscle and lung, with highest levels in muscle. Lower levels found in brain, colon, heart, kidney, prostate, small intestine and stomach. Weak expression in liver and pancreas. Belongs to the TORC family. Phosphorylation/dephosphorylation states of Ser-171 are required for regulating transduction of CREB activity. 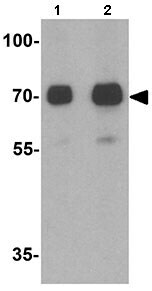 TORCs are inactive when phosphorylated, and active when dephosphorylated at this site. This primary site of phosphorylation, is regulated by cAMP and calcium levels and is dependent on the phosphorylation of SIKs by LKB1. Both insulin and AMPK increase this phosphorylation, of TORC2 while glucagon suppresses it. Cytoplasm. Nucleus. Translocated from the nucleus to the cytoplasm on interaction of the phosphorylated form with 14-3-3 protein. In response to cAMP levels and glucagon, relocated to the nucleus. Publishing research using ab167129? Please let us know so that we can cite the reference in this datasheet. There are currently no Customer reviews or Questions for ab167129.